This holiday season, Teleflora joins “Chuck,” Snoopy and the rest of the Peanuts gang in celebrating the 50th anniversary of one of the most cherished holiday memories of all, “A Charlie Brown Christmas.” They are paying tribute to Charles Schulz’s unforgettable TV special with two exclusive floral bouquets and a festive floral lineup that will surely delight everyone on your holiday list whether you’re decorating your home for the holiday season or looking for unique gift ideas for your favorite hostess. 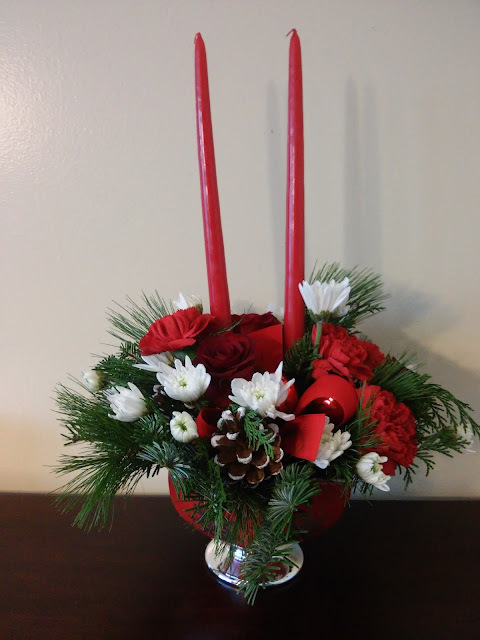 Ideal for gifting, entertaining and decorating, each bouquet arrives professionally-arranged by a local florist, and is presented in a keepsake holiday container that is sure to be cherished for many Charlie Brown Christmases to come. Commemorating the release of its exclusive bouquets, Teleflora is launching two national TV commercials entitled “Happy Dance” and “Ice Skating” that capture Teleflora’s Peanuts Christmas bouquets in nostalgic animated scenes based upon the legendary holiday classic. I got to decorate my house and get in the festive spirit with the Teleflora’s beautiful Silver and Joy Centerpiece! Elegant tapers glow warmly above this wondrous centerpiece of red roses and carnations, artfully arranged in a shimmering snowflake bowl. Hand-glazed, the food-safe ceramic piece will be a treasured serving dish and display piece for many winters to come!